Thank you Sterkoder for adding the latest pictures. It's impressive to see the ship, but as least as interesting to see all those wonderful details from Ålesund. I could hardly munch my breakfast fast enough this morning…just knowing there would be Sterkoder’s Ålesund waiting for me on CVF! Of course I come into the category he mentions of those that have visited the city before, but whether it is on my own subsequent visits, or vicariously through others images, I always come across some viewpoint or detail that is new to me as well as other ones that are old friends. 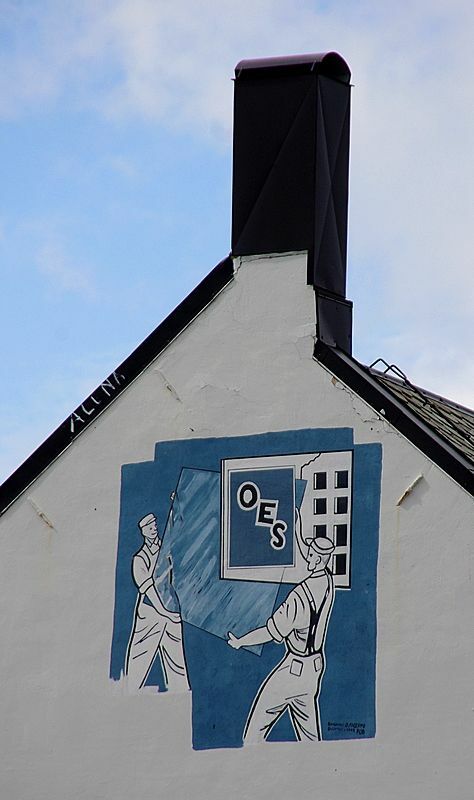 That glass merchant mural for example is new to me, and I am admiring in the artist’s work how the “glass-ness” of the glass is painted, and in Sterkoder’s photography how the inclusion of the chimney growing out of the gable end…and the “portrait” format…completes a pleasing image. And regarding the work of that excellent photographer (now NO BLUSHING Sterkoder! ), #524/1 is an unmistakable example of his assured and distinctive style. In fact it has set me off daydreaming instead of completing this appreciative post!!! (here I’m allowed to blush! ). I’m looking at the street scenes, picking some shop or other from amongst all the charming architecture … and imagining opening an art gallery with photo exhibitions on display. A pakarang room perhaps, and next to it a Sterkoder room in which this rusty chain takes pride of place. But it was the ship that drew you here this visit, and now I am looking at #522/3 which so well illustrates the extraordinary spectacle of seeing a giant ship placed among this intimate streetscape. Both elements, ship and city, are perceived in a different way when they come together like this. You have captured the connection Sterkoder –we talked about this quite recently in the context of your home city too. And again you show me the ship from a different perspective than when I saw Caribbean Princess moored way out in the Forth estuary here in Scotland (though I tried to convey something of the relationship to her surroundings there too). But it is undoubtedly her stern that exerts a considerable pull, irresistibly overcoming that part of one’s “rational” mind that is screaming “ I hate these so-called ships!”!!!!!! Ah, #527/2 and 3!! The first time I’d actually seen this kind of design of stern for myself at close quarters was Grand Princess in Copenhagen in 2009, and I wrote on CVF that it was “as if some giant troll was about to walk past, pick up the ship by this “handle”, and stride off along the Langelinie quay dangling it playfully by his side!”. Thanks for a great day out…and for the seagull! Added as Edit: no sooner had I posted this than I went on to look at the Cruise ships in Norwegian waters thread, and there ombugge has titled his web capture “Has someone dismantled the handle on this one?? Exactly! What a fascinating comparison. Last edited by Seagull; July 26th, 2012, 10:37. Thank you on the update of that wall logo, 'Ombugge' and a big thanks for your comment Cecilia!!! I enjoy Ålesund so much, and I want my own city to be like that during summertime. In Ålesund it seems like the passengers remain in the city when a cruiseship docks, and only being bussed to Atlanterhavsparken or Fjellstua. Here in Kristiansund buses are waiting in line to take passengers to the Atlantic Road..., out of town, so that only a small handful of passengers are left walking Kristiansund. This generates no life compared to what I experience in Ålesund. Someone wanted the local newspaper Tidens Krav to start writing about cruiseship arrivals beforehand again, like they did years ago. The writer said that people often came to the city from the ditrict around just to experience the cruiseship and life that was in Kristiansund such days. He wanted Tidens Krav to print the arrivals again, so that people could preplan their visit to Kristiansund. He wanted life in the city..., just like me. This is exactly what I do before going to Ålesund, to check out the cruise calendar, so there's bound to be people who would want to come to Kristiansund for the same reason. I think I will write a small article on the readers page in our newspaper, and give them the preliminary list of ships and dates for 2013. (In a hope to get more people visiting when a cruiseship arrives, just like we managed to create life in the city when SHTANDART visited). Well, thanks again folks for coming along on my short walk around one of Norways most beautiful cities, and for motivating and inspirational comments!!! How about offering a walking tour through the town (inkluding some Sundbaten trips) to the cruise companies. There must just be someone with an umbrella to do the leader. They could offer it as an alternative trip on board. Maybe this is of interest for some people. Thanks Ralf! Yes, I have many such thoughts in my head. Yesterday I caved in and started to upload pictures to FB, and latwr I will make my albums official/public. In a couple of albums I present Kristiansund and the region Nordmøre with Atlantic Road to the world. In a couple of days I will also hava a readers letter in print in the local newspaper here, concerning cruise ships in Kristiansund. So you know, my brain is rather focused on "giving" Kristiansund to potential tourists.. Impressive shots Sterkoder.... Ålesund is certainly a wonderful destination. Loved your massive Caribbean Princess shot... imagine when the ship gets scrapped in a decade or so, then buying it from the Indian scrappers and placing it on a rock towards the Norwegian sea as your personal private suite.. The changing light is the main feature. Thanks, 'Ombugge', for posting this link! Hurtigruten being moored at the "inner" harbour. Due to wind I suppose? I have one thing waiting for me, and that is one day to be at Alnæs lighthouse, be it nice weather or storm. Those who have noticed the tunnel opening in the City Park in Aalesund, close to the steps to Fjellstua, may have wondered what is inside the steel gate?? As can be seen, the system of tunnels and rooms inside the mountain is still in used, but for what?? Yes, seen that, wondered! Absolutely fascinating links, ombugge. Could somebody please give me a brief translation of what is said in the video? I tried to Google-translate the text but I don't really understand. It looks like some army-related tunnels? WWII? But some of the furniture looks fairly recent. Last edited by Sarnia; September 15th, 2012, 12:15. The tunnels etc. was built by mostly Russian prisoners of war but on behalf of the German occupiers. The are now probably used by Civil Defense, although I'm not sure. Anybody with access to the paper version of smp.no who can tell us??? PS> Many of the Russians are buried on Aksla, or at least was.